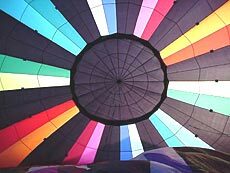 [JULY 28, 2001] Each August the skies in Lincoln are filled with a rainbow of color during one of the largest area events featuring the hot-air balloon. The 13th annual Lincoln Balloon Festival, sponsored by the Logan County Chamber of Commerce, is a three-day event which also features a fine arts fair, antiques market, car show, children’s activities and entertainment, to give visitors plenty to do in between balloon launches. Balloonists from all over the country participate in the event, attended by an average of 20,000 people. The festival displays 48 balloons, which is the capacity for the event location at the fairgrounds, according to event coordinator Pam White. Despite an expanded weekend schedule this year, with new offerings like a soapbox derby and fireworks display, White said she hopes the festival will continue to grow. "We’d like to do even more out at the fairgrounds. Hopefully within the next few years we will have shuttles running from the downtown area to the fairgrounds. We have to take it one step at a time. We want the festival to grow so it’s an entire weekend affair," she said. White says the attraction to the event is simple — "just the colors and a little basket attached to a balloon going up in the air," she said. "Anything that flies attracts people." 5 get in free. There is free parking inside the fairgrounds and at remote parking areas. In conjunction with the balloon festival, Lincoln’s 28th annual Art Fair will be at Latham Park downtown from 10 a.m. to 5 p.m. Aug. 25 and from 10 a.m. to 4 p.m. Aug. 26. A flea market, antiques and collectibles fair will be from 10 a.m. to 5 p.m. Aug. 25 and from 10 a.m. to 4 p.m. Aug. 26 at downtown Lincoln’s Scully Park, located one block south of the courthouse on Kickapoo Street. This event is sponsored by the Oasis Senior Citizens Center. A classic car show on the downtown square will also be from 10 a.m. to 4 p.m. Aug. 26. For balloon launch information and weather reports, call the Logan County Fair office, (217) 732-3311, during these times: 3 to 11 p.m. Aug. 24; 5:30 to 11 p.m. Aug. 25; 6 to 7:30 a.m. Aug. 26. For more information about the festival, call the Lincoln/Logan County Chamber of Commerce, (217) 735-2385, or check the website: www.lincolnillinois.com/ballonfest. A sheep, duck and rooster were the first lucky passengers to float through the air in a hot-air balloon, launched by Joseph and Ettienne Montgolfier in 1783. The first recorded manned flight, in a hot-air balloon constructed from paper and silk, took place in Paris that same year. According to www.balloonzone.com, local farmers were very suspicious of the fiery object descending from the sky, so pilots offered champagne to appease them and celebrate the first human flight — a tradition carried on even today. The first balloon flight in North America, piloted by Jean-Pierre Blanchard, was in Philadelphia in 1793, but it wasn’t until 1960 when the modern hot-air balloon was born. The first man-carrying free flight took place in Nebraska in a Raven prototype balloon constructed of a polyurethane-coated nylon and powered by a propane burner. balloons used for passenger flights today were developed in this country during the 1960s and have two main technological advances: rip-stop nylon, which is a safe and reliable material for the envelope, and a gas burner to heat the air in the envelope. Today there are over 5,000 balloon pilots in the United States alone. passengers ride and is usually made of lightweight, flexible wicker. To descend, the pilot allows the air to cool, and the balloon becomes heavier than air. The pilot has complete control of up-and-down movements by controlling the heat in the envelope. Once airborne, balloons just float with the wind. A pilot checks wind conditions before launching, so even though pilots can’t steer the balloon, they can move up and down to find a layer of air that will allow the balloon to change direction. During the flight, the balloon is followed by the chase crew, usually in radio contact with the pilot. The crew help the pilot prepare the equipment, hold open the envelope while it fills with cold air and apply weight to the outside of the basket as needed before launch. They also follow the balloon in a vehicle and help pack the balloon up and take it back to the launch site. Besides terrain, the other main concern for a balloonist is weather, especially wind conditions. Ideal weather for this sport consists of high pressure, moderate temperature and wind speeds of less than 8 mph on the surface. Most balloons fly within two or three hours of sunrise and sunset, when winds are calmest and conditions most stable. "The weather is very critical. We like to fly when winds are less than 10 miles an hour. You’ve got to watch that. When you’re flying, the biggest concern is looking out for obstacles on the ground. You don’t steer the balloon. You can go different directions by going different altitudes, but you just go where the wind blows," Ireland said. [JULY 21, 2001] A hot-air balloon ride taken during a 1985 vacation to California changed Jim and Nancy Ireland’s life. "We took our first balloon ride that year in the Napa Valley and kind of got hooked on it," Nancy said. We could flat among the stars together, you and I. Up, up and away, my beautiful, my beautiful balloon! The world’s a nicer place in my beautiful balloon. It wears a nicer face in my beautiful balloon. We can sing a song and sail along the silver sky. Upon returning to their home in Lincoln, the couple began working on a crew for a hot-air balloonist in the area, but that wasn’t enough to fulfill their passion for their newly discovered sport. They soon purchased their first balloon, named Sunglow for its bright orange color, and Jim earned both his private and commercial pilot’s licenses. The couple now own their third balloon, which retains the same name but is drenched in a rainbow of colors. "I just enjoy the flying part of it. I like to fly. It’s just fun to be with the people and see the smile on the kids’ faces," her husband added. The couple attend approximately 10 festivals a year, mostly in surrounding states, but have also flown several times in the Albuquerque Balloon Festival in New Mexico, which is one of the country’s largest events, with more than 500 participating balloons. Ireland, 60, who is soon to retire from his job with the Illinois Department of Transportation, said he and his wife, who is already retired, plan to do a lot more traveling with their balloon in the future when time allows. As with many hot-air balloon enthusiasts, the Irelands’ hobby is shared by their family. Their daughter Sherry, and her fiance are both hot-air balloon pilots, while their other daughter works on the crew. watching local events and assisting balloon crews. "He wanted a balloon, and I told him when he was 16 he could get his license. We bought a balloon last May, and now we are both student pilots," she said. Her 14-year-old son, Luke, is already studying for the day he can be a student pilot, and her 6-year-old daughter lends a hand, while her two older children also join in the fun when visiting. "It’s really a big family affair. We fell in love with that aspect of it. Groups of families crew together. For my family, it’s such a draw for us to be together," she said. "It’s fun the whole family can participate in together." Frazier, vice-president of the Balloon Association of Greater Illinois, has named her balloon "Oh, Baby" because it signifies family ties. While some pilots travel every weekend to some event across the country, Frazier, a principal at Heyworth Elementary School, said having a balloon has given her a way to help people. Although she does attend festivals and events in the Midwest, she has focused on events close to home and donated her skills to help raise money for a friend suffering from cancer, among other causes. "Some pilots travel every weekend and compete. It takes a fair amount of skill to make money competing, but some prize purses are much as $10,000. If you’re competitive, you can support your habit," she said. "We have given charity rides, and we use it for its fun. "It’s amazing. I feel that God gives you some neat talents you can share with people, and this is my way. When you see people get so excited about something that’s positive and healthy, it’s such a good thing." And, despite the fact that weather in the Midwest can be unpredictable, she says the view from above gives a new perspective to corn and beans. "I love the solitude. In the morning, the flying is unbelievably beautiful. In Illinois, to fly over a field of crops, it gives you such a good perspective of the beauty even here in the flatland. It gives you a different appreciation," she said. Frazier also says the sport is something people of all ages can get involved in. "A member of our crew is in her late 60s and she loves it. Whether you’re 2 or 72, there’s something you can do, like drive the car, give weather reports, move the basket and a lot of things that allows everybody to feel like they are a part of it." *Hot-air balloons cost about the same as a car or boat. The most popular sport-size balloons cost between $18,000 and $25,000. *There are more than 3,500 balloons and 5,000 licensed pilots in the United States. *Hydrogen balloons were used by both armies for airborne observations during the Civil War. 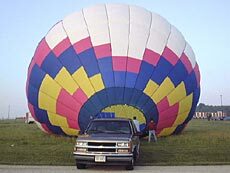 *Two major causes of accidents involving hot-air balloons are landing in high winds and contact with power lines. *Balloonists study all signs of air movement, such as flags, leaves and smoke. During very hot weather, pilots can judge surface wind direction by watching cows on the ground, who usually stand facing the breeze. The communities of Champaign, Lincoln and Danville, which all host balloon festivals, also seem to have the most hot-air balloonists and balloon dealers. One reason for that, according to Frazier, is that the tradition and love of the sport is being passed on to the next generation. "We’re all grooming our children. Many people who first got involved are now getting their children involved," she said. "The Lincoln festival was small enough at the start that people could get involved. Now, it’s the second largest in central Illinois." The best time for flying in central Illinois is during the months of August, September and October. "That’s prime ballooning season. The weather is more stable, and we have less rain and turbulence," Frazier said. "But flying in the winter is beautiful. You just have to dress warmer." 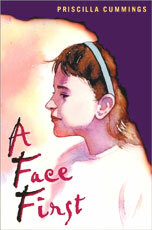 [AUG. 15, 2001] “A Face First" by Priscilla Cummings. Dutton Children’s Books, 2001, 197 pages. As the story opens, we are introduced to 12-year-old Kelley and her mother as they go through the normal morning routine of getting ready for school and work. At this point, Kelley’s world revolves around her horse, ballet lessons and an environmental project involving an endangered bird. The end of the first chapter drastically changes their lives. Kelley and her mother are in a horrible accident, leaving Kelley with her face, leg and hand badly burned and her leg broken. When she wakes up in a room at Baltimore Hospital’s burn unit, she is very disoriented and can’t remember the accident. The next several chapters deal with the severity of her injuries, the reality of the recovery process ("Twice a day they come in and pull the dead skin off my leg with tweezers and Q-tips. It’s called debridement. "), and her questions about the accident, which causes her to withdraw from family and friends. Kelley has several skin graft operations including her face. She is introduced to pressure garments that she must wear for about a year to keep the grafted skin from becoming hard and puffy. The final withdrawal comes when the clear plastic mask is strapped on her face and Kelley resists in the only way she can: She quits all human communication. Kelley is moved to a room in pediatrics because the burn unit is full. Her roommate is a 2-year-old girl who has also been burned. Kelley is moved by the child’s circumstance and tries to comfort her. The process of letting the child into her heart gets her to speak again, but she still draws the line at seeing friends and returning to school. After a long eight weeks, Kelley gets to go home. To her surprise and joy, her sister, Leah, returns from Europe, where she was studying for a year, to help with Kelley’s tutoring. As it turns out, there are financial reasons for the return as well, and Leah gets a job in the afternoons to help out. Leah is a very positive influence in Kelley’s life, and with her encouragement, the walls begin to break down. Leah brings to Kelley’s attention that their mother is also having problems. She looks very tired all the time and has trouble concentrating. Kelley hears a message on the answering machine from an unknown doctor. Her mother brushes it off, which only makes Kelley more worried. Eventually all of the questions about her mother and the accident are answered, and Kelley can finally begin to heal. Teens will identify with Kelley’s character completely. How can she ever relate to her friends again when most of their interaction has involved the mall and makeup? What does she think about a God who, as some people have told her, allowed this to happen? How will she feel about her mother if it turns out that she is legally at fault? The subject matter of the book is sometimes tough, but it is well worth the effort. As reviewer Mary E. Heslin of VOYA magazine says, "Kelley is a heroine worth knowing, and like her scarred face, worthy of a second look." This book is recommended for ages 10 and up. For more information, visit the library at 725 Pekin St. or call (217) 732-5732. Click here for Aug. 9 LDN posting: "Stuart Wyneken turns out the lights after 30 years with LCT summer productions." [AUG. 3, 2001] Theatre 7 in Decatur will host a drama workshop on Saturday morning, Aug. 18. The workshop will include sessions on auditioning and non-acting opportunities in theater. All of the directors from Theatre 7’s upcoming season’s productions will also be present to give workshop participants information and insight into the shows. The workshop will be an excellent opportunity for anyone interested in getting involved in community theater. People of all ages and backgrounds are encouraged to attend. The workshop will be at the Theatre 7 headquarters, downtown Decatur, 131 N. Water St., from 9 a.m. until 1:30 p.m.. There is a small fee and lunch is provided. To register or for more information, call 423-2107 or send e-mail to theatre7@decaturnet.org. Theatre 7’s website is at www.decaturnet.org/theatre7. [JULY 31, 2001] Season tickets are now on sale for the 38th season of Theatre 7 — Decatur’s Community Theatre. Call the Decatur Civic Center box office, 422-6161, for more information. All shows will be performed at the Decatur Civic Center Theatre. The following shows will be presented as part of the coming season. Nov. 2-3 and 9-10, 7:30 p.m.
Nov. 4 and 11, 2 p.m.
A backstage farce about an acting couple in the 1950s who have one last shot at stardom as a famous movie director is on his way to Buffalo, N.Y., to see them perform. Misunderstandings and mistaken identities pile up for loads of laughs. Written by the author of "Lend Me a Tenor." Feb. 8-9 and 15-16, 2002, 7:30 p.m.
Feb. 10 and 17, 2002, 2 p.m.
A successful writer of Broadway thrillers is struggling to overcome a "dry" spell when he receives a script from a student. Suspense mounts steadily as the plot begins to twist and turn with devilish cleverness that will hold you enthralled until the final, startling moment of the play. April 12-13 and 19-20, 2002, 7:30 p.m.
April 14 and 21, 2002, 2 p.m.
A deliriously witty festival of songs and rollicking humor unfolds on a luxury ship making the Atlantic crossing in 1934, with a society girl caught between her finance and her boyfriend, a nightclub queen, a bevy of Times Square sirens and a slightly nervous gangster. Songs include "I Get A Kick Out of You"; "Blow, Gabriel, Blow"; and "You’re the Top." [JULY 25, 2001] The newly formed Logan County Arts Association seeks to forge a bond between the people of Logan County and the arts. The arts association is in the process of determining how their logo should appear. Local artists and other interested parties are asked to submit their rendition of a new association logo. Use the name Logan County Arts Association. Use unique identifiers of Abraham Lincoln. These could include his signature or even his hat. The winner of this contest and results will be announced in Lincoln Daily News. Entries should be submitted by Aug. 20. Or submit your entry by e-mail to ldneditor@lincolndailynews.com, with "Art Association logo" on the subject line. Call Marshall Jacobs, (217) 899-6243, with any questions you may have about the association or logo. Lincoln Community Theatre’s website is up and available. The site serves a number of functions, from providing information on becoming a season ticket holder to showing what new productions are being planned. Pictures from last season's productions are also posted. If you are interested in joining a performance or just going to see one, visit LCT’s website at www.geocities.com/lincolncommunitytheatre/index.html, e-mail LCT at lincolncommunitytheatre@yahoo.com, or write to Lincoln Community Theatre, P.O. Box 374, Lincoln, IL 62656.